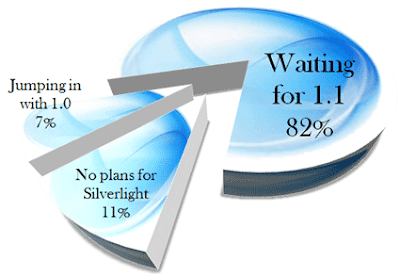 that Silverlight 1.0 is more or less a "placeholder" release for Silverlight 1.1 in most developer's minds. Sure there are some big Microsoft partners releasing Silverlight 1.0-based applications, but the real goal of Silverlight 1.0 is to start generating the all important install base for the auto-updating Silverlight plug-in. The serious use of Silverlight on many sites is going to depend heavily on Microsoft's ability to quickly distribute their plug-in to a large percentage of Internet users. I'm not suggesting that Silverlight 1.0 doesn't have any merit. If you look at the "large partners" implementing Silverlight applications this year you'll find a lot of interesting media-centric applications- MLB, WWE, HSN. And that's about all you'll find. Silverlight 1.0 is a great web-based video player, but a lot of business applications aren't looking for fancy video players. Instead, business developers are waiting for Silverlight 1.1 before they really place a lot of weight in this new platform. But don't take my word for it. The survey says it all. the tools for SL 1.0 are not mature and currently they seem a bit cluttered. i hope things will be good to start SL when 1.1 will be ready.